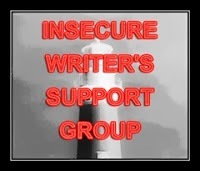 As you surely know by now, today is the first Wednesday of the Month which means it's time for the Insecure Writer's Support Group led by Ninja Captain Alex and this month's cohosts CD Coffelt, Tina Downey, Isis Rushdan, and Michelle Wallace. So if you haven't done so yet, jump on the Linky and release your fears and insecurities into the world. I'm already 8K behind the pack, and things aren't looking good. yes it's mine. You may post it, but link back to me. That's right, that's the formula for a novel. It just isn't a formula for a GOOD novel. That doesn't exist. And of course, I want a good novel. So I guess it's back to the pit of word sprinting. This is why I don't do Nano! I know I'd fall behind right away. :P But you have plenty of time to catch up and I'm sure you can do it! Good luck! You mean all those formulas the structure self help gurus spit out don't work? Well, sort of. The formula is flesh and bones of the problem, especially for a novel. What makes it good is the soul. So they might have something, but without putting a lot more into it, you just can't get there from here. 8,000 words. Psshh...easy, breezy. C'mon! Let's see you rock it ;) And hey, if you don't make 50K by the end of the month... at least you will have rocked the part that you did! I'm cheering for you over here. Didn't know you were doing NaNo, but good luck! ^_^ Keep us posted. Love that formula! Good luck with Nano! And go you! It's still early in the month, which means plenty of time to catch up! 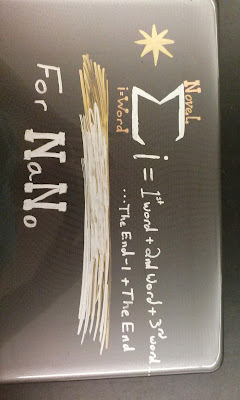 I'd try to be more encouraging about NaNo, but I failed NaNo last year. Writing quickly is just not my thing. But good luck with it. Even if you don't finish, you'll have the basis for a good story. Bummer, thought you'd found the answer!